I run teflSearch and work at Distilled. I write here and also do some conference speaking. I try to post useful things to my Github and I wrote a Chrome plugin you might find useful for SEO. This year before BrightonSEO, I spent a lovely day in the bottom of a dark pub with a bunch of smart people at ohgmcon (a small conference/get together run by Oliver Mason). Tom Bennet gave a presentation about the JAM stack and his pitch for why it’s the future. I’ve been putting off making a blog for ages and this seemed like a good opportunity to create a static site. It’s live now (as you may have noticed), so here are my thoughts on the whole thing. Would I recommend the Netlify + Hugo combo for a blog? Yes, as long as you’re relatively technical. You’ll need to be able to look at a command line with panicking. If you’re not I’d stick with Wordpress at the moment. It’s really really fast. Even with all the JS my pre-built theme came with, it’s fast. I don’t need a worry about security, because my blog will realistically never need a backend. Netlify offers a lot of excellent one click server side features like HTTPS which were lovely and easy to set-up. Although theme/boilerplate dependent, there are some nice one click integrations like Disqus. If you want to customise your theme, you’re going to need to be familiar with some JS development workflows. This didn’t seem as immediately friendly as PHP had been (although this may be curse of knowledge now). If you’re not already familiar with Git & the command line I suspect this whole process will be notably more scary. Although on the flipside, if you are comfortable with this then this is possibly a plus. Compared to other Markdown editors I wasn’t particularly impressed with Netlify CMS out of the box. Fancy giving it a go? Read on. Hugo - A static site generator. It takes content and templates and turns them into a set of HTML pages. Netlify - A place to host a website created with a static site generator. This part wasn’t too bad. I managed to follow the instructions here without issue. The /site/ is where all the development happens. When you run the server, it’s all built and served from /dist/. Until you add a theme virtually all the customisation happens in config.toml or in the posts themselves. Gotta go read all that theme documentation. There was no quick win I found for finding a good theme, sorry all. Set theme in config.toml - theme = "my_theme_name"
If you’ve cloned a well maintained theme to get updates and want to customise it past the in-built options, you’ll need to fork it into your own repo so Netlify can use that as the sub-module or work with the theme owner to fork/contribute to the original repo. Aside: A sub-module is where you have one git repo hosted inside another. I had not encountered this before. Useful SO thread. I wanted to customise my theme past the in-built in options and so needed the ability to build it. The theme required node-gyp, which has a couple installation issues on Windows. I have Anaconda 3 installed as my default version of Python, this clashed with the node installer and I had to manually set the python environment. npm config set "python" "C:\ProgramData\Anaconda3\envs\py27\python.exe"
Node-gyp also needs Visual Studio Build tools. Don’t you just love developing on Windows? This seemed to happen sometimes when I referenced something that didn’t exist - like a theme. I installed Netlify CMS (following the quick start, no real issues), but it’s not a wonderful experience. I didn’t enjoy working with a split of markdown and rendered markdown and the whole thing felt a little new and lacking. If I’m going to write more, I want to enjoy it, so out went Netlify CMS and in went Typora. It’s a great experience. 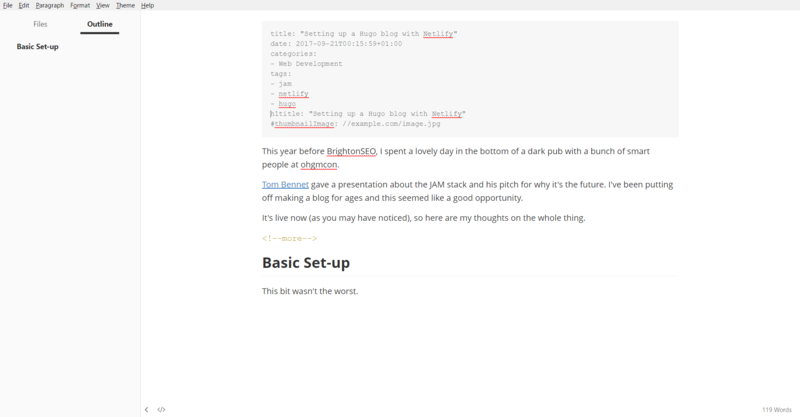 Markdown switches to rendered markdown as you write it and it’s a clean distraction free experience. That's better. This is genuinely one of the best writing experiences I've had. It’s free until the beta is up, then paid for. At which point I will quite happily pay. Aside: This isn’t required for a static site in Hugo, however I was using the Victor Hugo boilerplate, which does come with all that. This was probably the biggest learning curve for me. If your background is in the traditional Wordpress, Drupal etc. then there’s a reasonable chance you might not have encountered many JS workflow tools before. For example: in Drupal I’ve traditionally handled everything with AdvAgg, I upload CSS and all the minification and aggregation is done server side. With a static site generator, all of that is of course done locally as part of the build process. Victor Hugo uses a combination of Webpack and Gulp, I was familiar with neither. I am using the Theme TranquilPeak. It looks lovely, but from an SEO point of view has a couple issues. It doesn’t come with any, but I also don’t have enough posts to have to fix it yet. When I do I will come back and update. There’s nothing built in and while it’s easy enough to add a variable to no-index posts, I couldn’t work out how to do so cleverly for all the other bumpf pages it generates like taxonomy and category pages. No-inbuilt canonicals, this was easily solvable by adding it to the main head.html. For news-worthy and time sensitive content, I actually quite like having the date in the URL, it provides a strong signal both visual and semantically about the importance of time to the page. Clearly everything I write is timeless though, so the last we want are dates in the URLs. Dang, that would be pretty sweet. At this point I’ve now been managing accounts and clients for almost 4 years. I am no longer totally awful at it. It’s a lot easier to value hard skills so they tend to get taught more, but the soft are just as useful. This post is about the soft. This was annoying. The solution I talk through below is still not perfect. A little background first. As a side project to better understand chrome extensions, I built this extension Traffic Light SEO. As you navigate to a page, it shows a preview of title and meta description as it would appear on Google, and 3 traffic lights which will tell you if a page is indexable by Google. A lot of SEO work begins by digging into rankings. We pay a lot of money to services that track rankings and for good reason, it’s really really useful. Sometimes however we need to do it ourselves. I’m going to share one possible way and how to do it on Google’s Hotel Search. Goodbye good times and hello to immediate stress. You’ve landed on this post in a time of need (or possibly because you’re researching job interview questions), so let’s cut the pre-amble and jump into it. If you spot an issue with the JS on your page in fetch and render (F&R) or the mobile testing tool (MTT), what are the chances Googlebot is actually having that issue? Do those three different methods render JS in notably different ways? Let’s find out out? With the mobile index coming up on us, I’ve recently had to do a fair bit of mobile auditing. Some of it can be quite a lot of work, so I’m sharing some of the processes I use to speed it up. We will specifically be looking at auditing content and structured data. This post will show you to get setup with Python so you can use it in your day to day work. Why learn Python? Sounds like an awful lot of work. Boy and it’s pretty late in the afternoon already. That’s not this post. When I’ve written that post, I’ll come back revisit that. Traffic Light SEO, is a chrome extension, designed to show you a page’s indexation and meta data passively as you are browsing around the internet. You can download the extension here.